For plug-in hybrid electric vehicles, consumption rates are displayed separately for electricity and gasoline. Kilowatt-hours is an energy unit for electricity. This electricity consumption value tells you how many kilowatt-hours the vehicle would use to travel 100 miles. Like gallons per 100 miles, this kilowatt-hours per 100 miles relates directly to the amount of electricity used, and thus to cost. This is an estimated rate of consumption; any given vehicle may or may not be actually capable of traveling 100 miles in electric operation on a fully charged battery. There are two ratings that apply to each vehicle—one for fuel economy and one for greenhouse gas emissions—but the label displays only one rating for most vehicles. This is because carbon dioxide emissions are directly related to the amount of fuel consumed. This relationship varies from fuel to fuel, but both rating systems are based on gasoline vehicles, meaning that gasoline vehicles get the same rating for fuel economy and for greenhouse gas emissions. In cases where the fuel economy performance and greenhouse gas emissions do not yield the same rating, the rating bar will display two pointers. The Fuel Economy and Environment Label provides a Greenhouse Gas Rating, from 1 (worst) to 10 (best), based on your vehicle's tailpipe carbon dioxide emissions only. This rating does not reflect any GHG emissions associated with fuel production. 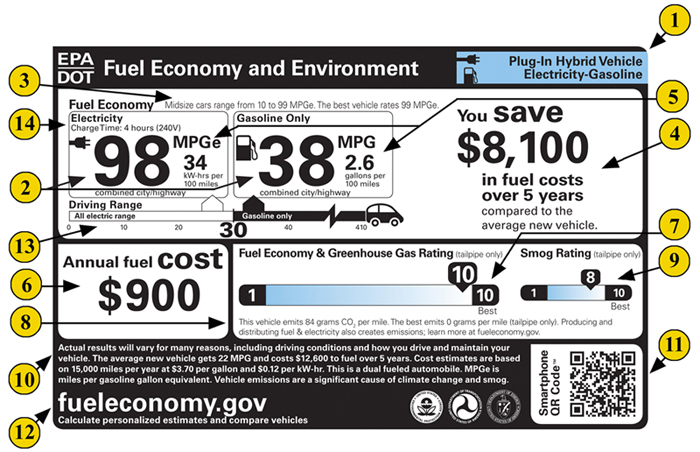 This part of the label also details the assumptions that are used to determine the estimated annual fuel cost and the value used to compare 5-year costs to the average vehicle. EPA assumes annual mileage of 15,000 miles. The price of gasoline and electricity listed on new vehicle labels is based on projections from the U.S. Energy Information Administration for the applicable model year. It is typically updated annually in coordination with the Department of Energy. The sample labels include an example price that is intended for illustrative purposes only. When you are looking for a new vehicle at a dealership, you can scan the QR Code® on the label using your smartphone, provided you have downloaded a scanner app. The QR Code® will link you to helpful tools and additional information about the vehicle. The same tools and information are available on www.fueleconomy.gov. The label directs you to a fueleconomy.gov, where you can compare vehicles and enter personalized information (e.g., local gas prices and individual driving habits) to get the best possible cost and energy-use estimates. When the vehicle is fully charged, this value represents the approximate number of miles that can be traveled in combined city and highway driving before the vehicle must be recharged. This indicates how long it takes to charge a fully empty battery using 240 volt electrical service. For the purposes of equivalent comparisons, all vehicles with external charging capability will display a charge time based on use of 240 volt service, unless the vehicle is not capable of receiving the higher voltage. Some owners may choose to install 240 volt service (in their garage, for example), and others may choose to use a standard household outlet providing 120 volts. Use of lower voltage than that specified on the label will result in longer charging times. The vehicle manufacturer should be able to provide complete information on charging times and the capabilities of their vehicles.